ebm-papst, a German manufacturer of fans and motors, has chosen Celanese Corporation’s Celstran long fiber reinforced thermoplastics (LFRT) to produce the radial fan impellers for its new RadiCal fan series. 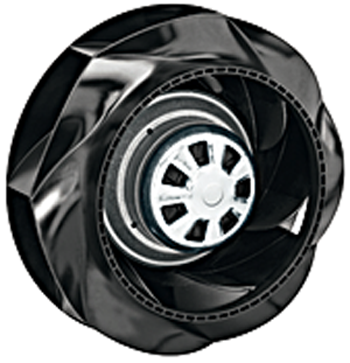 According to Celanese, Celstran LFRT, a composite made from a thermoplastic polypropylene (PP) matrix and unidirectional long glass fibers, offers high stability for the RadiCal fan impellers, which is exposed to high mechanical loads. The glass fiber reinforced polymer combines high strength, lightness and moldability to enable flow-optimized blade geometries, and provides UV protection, chemical resistance and good impact strength without the need for additional treatment, notes the material supplier. Being used in commercial kitchens, offices and factories, the new RadiCal fan series, without spiral housing, was developed with GreenTech EC motors, backward curved blades and a high level of hydraulic efficiency. It has the same dimensions as its predecessor with asynchronous motor, which the new version can replace. ebm-papst used simulation models to optimize the impeller shape. Models were compared to measurements on prototypes to avoid great cross-sectional jumps and flow losses in the finished model. This step in the developmental phase, coupled with the good damping characteristics of the Celstran LFRT-PP, helped reduce the noise level generated by the fan.